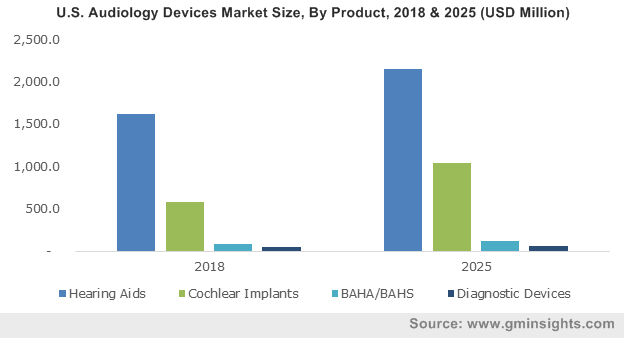 Growing prevalence of deafness coupled with an expanding global geriatric population base to drive audiology devices market growth « Global Market Insights, Inc.
Audiology devices market, thriving on the cusp of digital interventions, has witnessed remarkable proceeds over the past decade. Introduction of DSP (Digital Signal Processing) in hearing systems has been heralded with great expectations and acclaim. With better fidelity and improved performance, modern day’s digital hearing aids claim to offer greater restoration for a wide range of perplexing auditory deficits. Needless to mention, companies partaking in audiology devices industry are leaving no stone unturned to exploit the maximum potential of this technology. Starkey’s recent launch of Muse iQ Rechargeable 900sync™ is an apt evidence of the same. Elaborating further, Muse iQ Rechargeable that has been unveiled by Starkey Hearing Technologies in the beginning of this year is claimed to be world’s smartest and smallest hearing aid. Based on the company’s flagship Acuity™ OS operating system and award-winning Synergy® platform, this breakthrough hearing aid offers high-definition clarity, sound, and presence. While Starkey’s deep-rooted stance in audiology devices industry in not unheard of, bringing market’s smallest technology enabled hearing solution is certainly a breakthrough of sorts. As claimed by sources, this groundbreaking technology was launched at Starkey’s Hearing Innovation Expo based in Las Vegas. It is undeniable that hearing aids are the most convenient clinical intervention for hearing deficiencies, subject to which it has procured maximum of the audiology devices industry share in 2016. However, it has been observed that recent technological advancements have led to an increasing deployment of alternative hearing devices. Growing awareness and utilization of cochlear implantation (CI) can be majorly attributed to this fundamental aspect, driven by its cost-effective outcome-based solutions. It is imperative to mention here that the utilization rate of cochlear implantation in major part of the world is higher for children than geriatric populace. The trend is synonymous for the U.S. audiology devices market where the utilization rate among children having appropriate audiological profile is nearly 50%. Whereas it is less than 5% for the adult profile. When being surveyed on a much larger base of adults than children who suffer from profound hearing loss, it has been observed that cochlear implantation surgeries in the country cover 60% adults and 40% children. Despite the fact that this technology has received FDA approval long back, experts believe dearth of proper awareness campaigns is somewhat hindering its full-fledged optimization in audiology devices market. Nonetheless, the ongoing research activities is certain to open new doors of opportunities for audiology devices market, through which unconventional hearing device manufacturers seem to garner profits. Add to it, growing geriatric populace vulnerable to hearing deficits is bound to create massive demand for product innovation in the marketplace. In this regard, experts claim, implementation of stringent regulatory norms related to hearing devices will have a significant impact on the product development. In terms of profitability potential, Global Market Insights, Inc. forecasts audiology devices industry size to surpass USD 10 billion by 2024. This entry was posted in Healthcare & Medical Devices and tagged Audiology Devices Market, audiology devices market size, Audiometers, BAHA, BAHS, Behind-the-Ear, BTE, Canal, Canal Hearing Aids, Cochlear Implants Market, Diagnostic Devices, Digital Hearing Aids Market, Global Audiology Devices Market Analysis, Hearing Aids, Hearing Disorders, Hearing Impairment, In-the-Ear, Otoscopes, Receiver-in-the-Ear, RITE, Tympanometers, U.S. Hearing Aids Market U.S. Audiology Devices Market, United States Audiology Devices Market Overview, United States Hearing Aids Market Overview.